I had about 4 different plans made for this ride and in the end I used none of them and planned a 5th route on the Friday morning. On the Thursday I had to go to the Doctor as I had a problem with an ingrowing toe nail. It had been troubling me for over 3 months and was now becoming quite infected. The Doctor prescribed a course of antibiotics. Yep that will fix the infection but I have a reaction to antibiotics. They tend to loosen me up a bit my regular habits become a lot more regular. 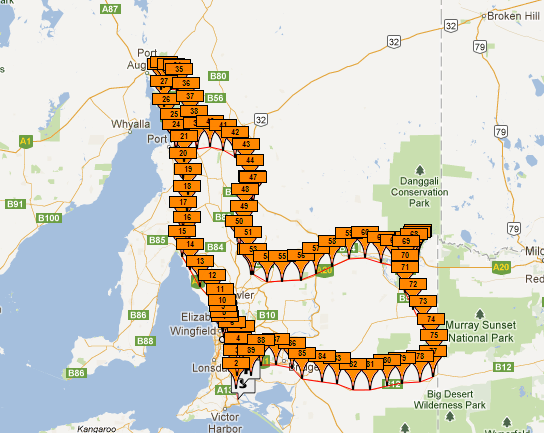 I had planned to ride from Goolwa to Cobar via Renmark. In the end my wife talked me into returning to Goolwa on the Saturday afternoon to drive my car to Cobar so I could drive her car back to Goolwa to Register there as we are moving back there in November. So with a little quick planning I came up with a FR12 Gold that I had registered for. 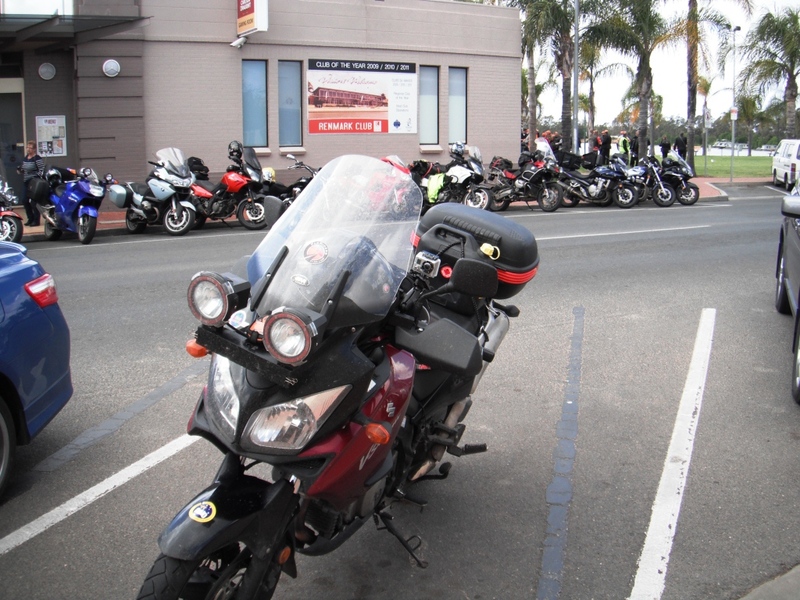 My ride started from Goolwa and I grabbed my start receipt from the BP service station 15:56 and off I rode. 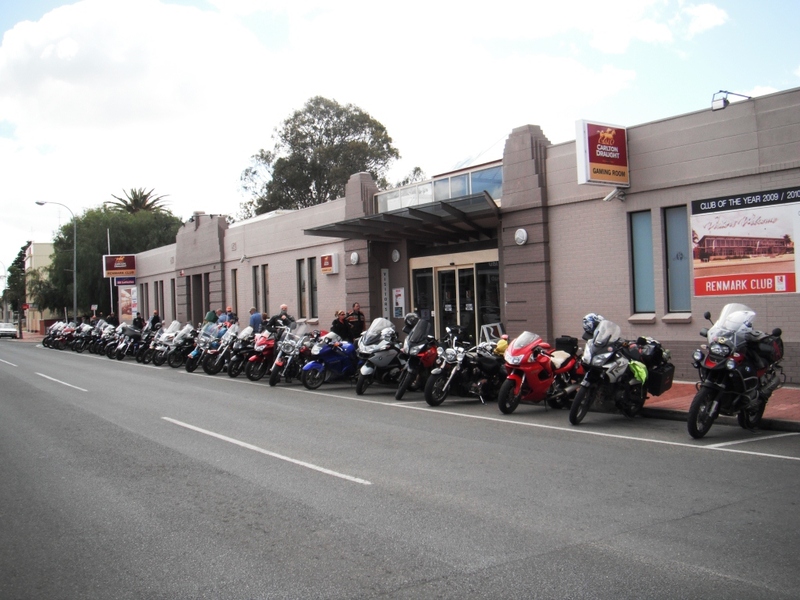 I had planned to head north from Goolwa up through the Adelaide hills and then head through to Port Pirie. After heading towards Strathalbyn I turned towards Meadows about 14km from the start of my ride. These roads are normally bliss to ride through but with battling the wind as far as Hahndorf I made the decision to get onto the south eastern freeway and head into Adelaide and then up to port Pirie from there. This was not a major change to my plan really but I thought it safer due to the amount of debris blowing off the trees. I had been thinking that one bit of bad luck with a limb falling into path was not worth the ride up through the hills, no matter how remote the odds were. 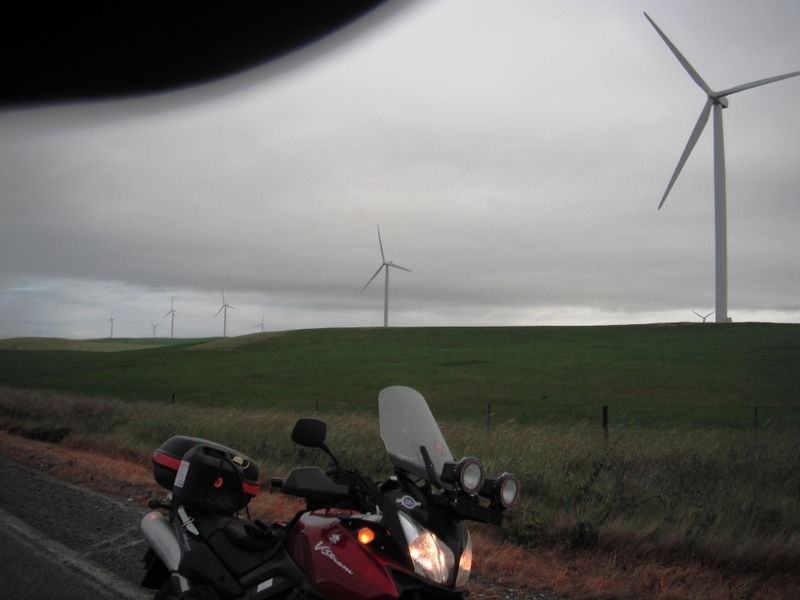 The ride into Adelaide was made in heavy rain but once off the freeway the weather eased heaps and it was a comfortable ride through to the northern outskirts of Adelaide. Once out of the town limits and riding north with the gulf not to far to my left I was again battered with heavy cross winds however I was still able to make good time and was arrived at Port Pirie to refuel and have something to eat. I was booked into the Hotel at Wilmington but they had told me that the kitchen would be closed by 8pm I knew I would not Make it until after then. So it was food from the pie heater. Always worries me just how long the food has been in them. Anyway I thought after visiting 3 loo’s to get this far I may as well eat. Anyway the food was ok. I talked briefly to a lady in the roadhouse dining room and she had asked if I was on the bike outside and if I had ridden from Adelaide. Yep that was me. She said that she had made a remark to her husband that she was glad not to be on a bike as they were watching me getting knocked about by the wind. Well time to head to Wilmington. I left the roadhouse and into the darkness of the night again. 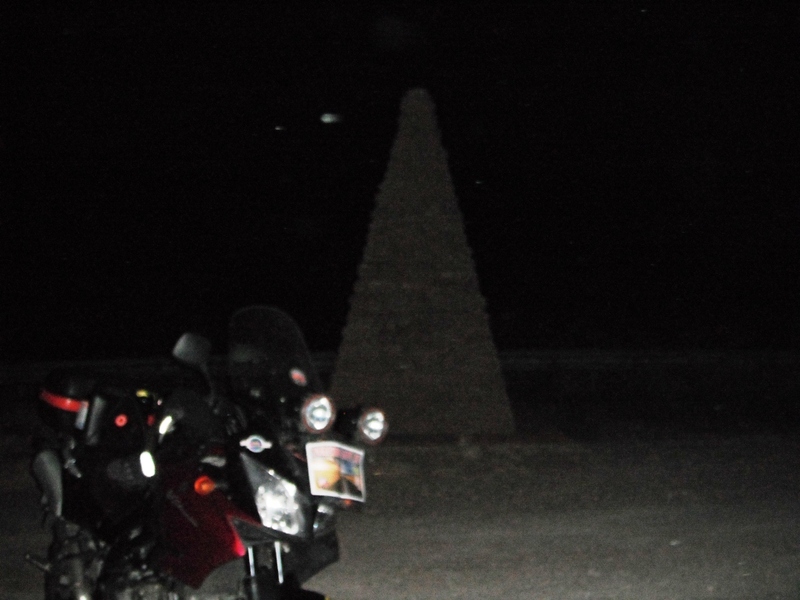 I tried to find Davo’s plaque on the way to show my respects as I could not make the ride earlier in the month. Alas I could not find it in the dark. Next time. So off I head through Horrocks Pass. No wonder it was one of Davo’s favourite sections of road. It had not rained for some time here and the wing now behind me had well and truly dry them. I enjoyed it . Stopped at the top for a FarChallenge picture. It was then just a short ride to Wilmington and I arrived at about 21:00. As walked in the door I was greeted by a lady said “Hi, you must be Cliff. Yep that’s me. The place was rockin’. The locals were have a good time. The owner asked me if I would like to park my bike around back locked in the yard. I said that would be good but I planned to leave early so would need to get my bike out. “No worries mate I will show you were I hide the key. Would have to recommend this place to anyone riding through. Friendly people and the bed was very comfy for a hotel. When I woke at 5am I really didn’t want to get out. But I did. On the road again before 6am heading south towards Clare. I really have to go back sometime to explore the area better. 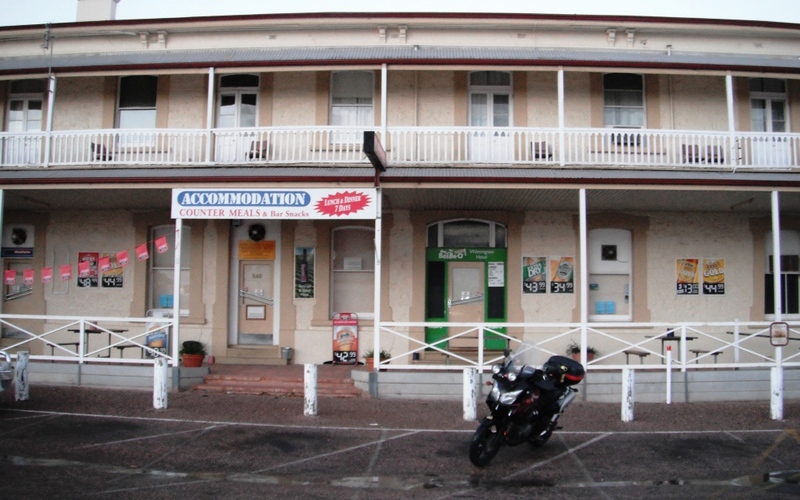 Fueled up at Burra and met Fellow FarRider Nerfarm FR 206 and his Wife (now an exFarVirgin) Annette FR 619. 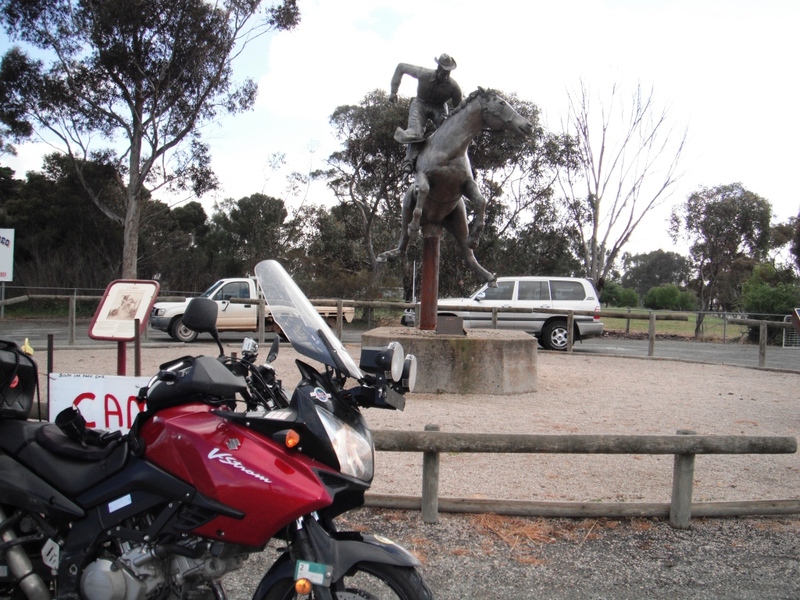 After refueling headed south to Kapunda and passed through a town called Marrabel. spotted an interesting Statue an stopped for a quick picture. Then onto our checkin and RTE location. Renmark. 101 riders completed the FarRide successfully. There were a few who didn’t make it due to breakdowns. Some great looking bikes here. completed My check in but I hadn’t completed my FarRide. so back on the bike but had to pull up before I left town. you can guess why. another loo stop. this was starting to get beyond a joke. 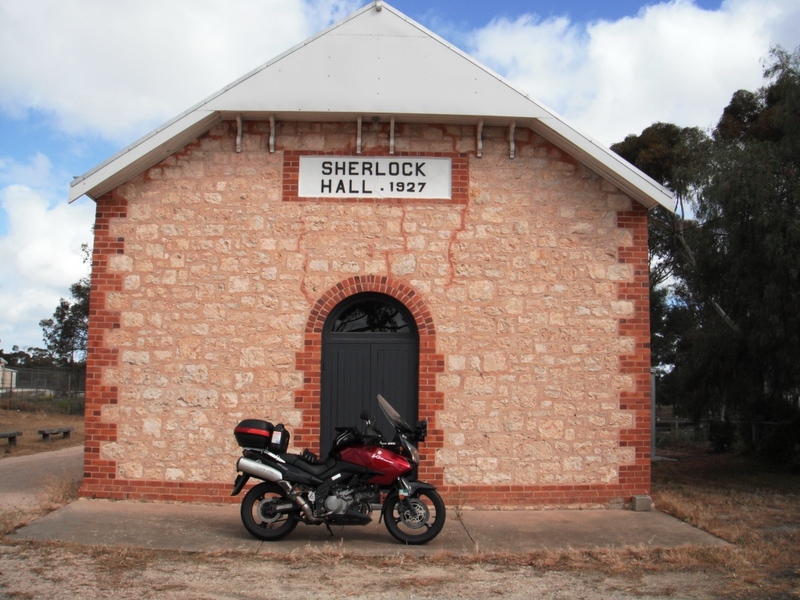 eventually left town and headed south to Pinnaroo. from there I took a right and headed west towards Murray Bridge. stopped at Sherlock to get this photo. rest of the ride was fairly uneventful and I only needed to stop one more time. Fuel docket at Goolwa. FarRide 12 Gold successfully completed. total of 1,266 km ridden.